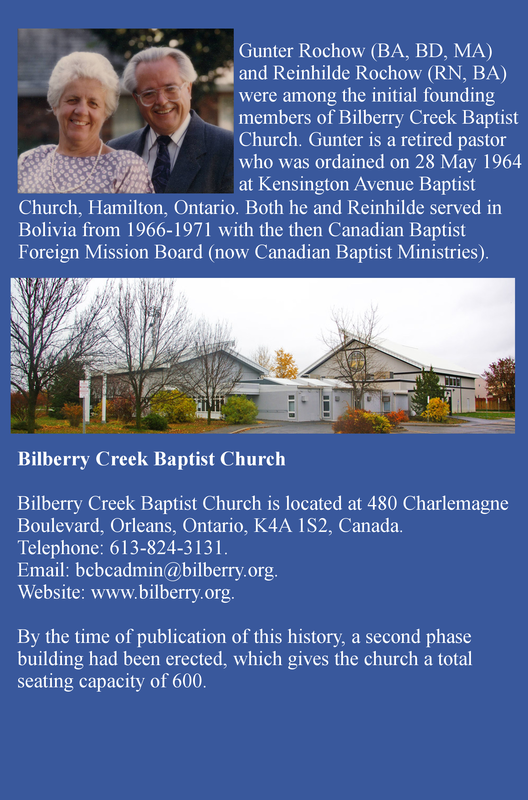 Bilberry: A Seed in Good Soil is a thematic history of the first 25 years of Bilberry Creek Baptist Church (BCBC) in Orleans, Ontario, Canada (www.bilberry.org). It describes how this English-speaking church entered into a “partnership of equals” with its French-speaking sister church Église Évangélique Baptiste d’Orléans to serve their bilingual community through a single church plant. This arrangement had unique programming and financial advantages for both congregations. Together, both experienced vibrant spirituality and engaged in effective evangelism; and Christian service to the community that was recognized by the media from coast to coast. The history addresses five themes: (1) Worship; (2) Preaching, mission and evangelism; (3) Teaching; (4) Fellowship; and (5) Service. In its approach, BCBC is inclusive among Christian organizations and multi-ethnic in the make-up of its congregation. It is affiliated with Canadian Baptists of Ontario and Quebec. With forewords by the Reverends Don Collar and Neil Hunter. This publication contains more than 30 pictures from the archives, and is available for purchase in either full colour; black and white; or in digital format. Whichever option is chosen, all proceeds from this labour of love contribute to the mortgage retirement fund of Bilberry Creek Baptist Church. © 2014 - Gunter and Reinhilde Rochow. All Rights Reserved.